Liverpool defender Virgil van Dijk admits he has to learn from his mistakes on a painful night in Paris. The Holland defender's half-clearance led to Paris St Germain's crucial opening goal to pave the way for the hosts' 2-1 victory and leave Jurgen Klopp's side facing a must-win encounter at home to Napoli if they are to progress to the knockout stage. 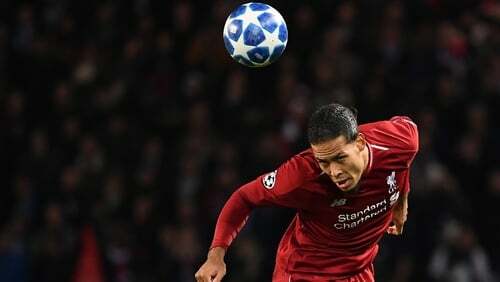 Van Dijk was far from his usual unflappable self and he said it was an experience he would use to make himself better. "There are certain moments where you need to keep your head cool. It was difficult," he told LFCTV. "There were good things in the second half but to lose is painful. "The (first) one I tried to clear, the ball came behind me a little bit and they picked up the second ball. "The second one was on the break - that's what they're good at. We need to do better. "You make it difficult for yourself if you're 2-0 down, especially after 30 minutes or so. "We bounced back in the second half, we did well. Now the point is to recover from this and make sure everyone is ready for the weekend." The focus immediately turns to a home Merseyside derby as Liverpool look to extend their unbeaten start to the Premier League season and keep pace with leaders Manchester City. However, looming on the horizon in just under a fortnight is a more crucial match against Carlo Ancelotti's Serie A side - a match Liverpool have to win either 1-0 or by at least two clear goals to progress their Champions League campaign. They can, at least, take confidence from the way they controlled their first meeting prior to conceding a 90th-minute winner in the Stadio San Paulo. "Yes, that's the only thing that's left. We need to be up for it and we will be," added Van Dijk. "We need everyone for that and I'm not in doubt that's going to happen. "Everyone is going to be ready for it. Until then, we need to be ready for the league as well and win our games." Klopp was concerned by their slow start in Paris which handed the initiative to their opponents but he will have no such worries against their near-neighbours on Sunday, who have not won a league match at Anfield since 1999. "Come on, it's a derby, we don't have to show reaction," he said. "If we won 5-0 it would be the same. This game is isolated from the season, it's a derby, it's at home. "Everton are doing really well this season, they are a different cup of tea to the last three years. "We have to be 100 per cent spot on for a tough one. It's not about showing a reaction, it's about carrying on, 'Go, go, go in the league', win your home games, win your away games, and that's it. "It's not what I say here, it's what we show there."